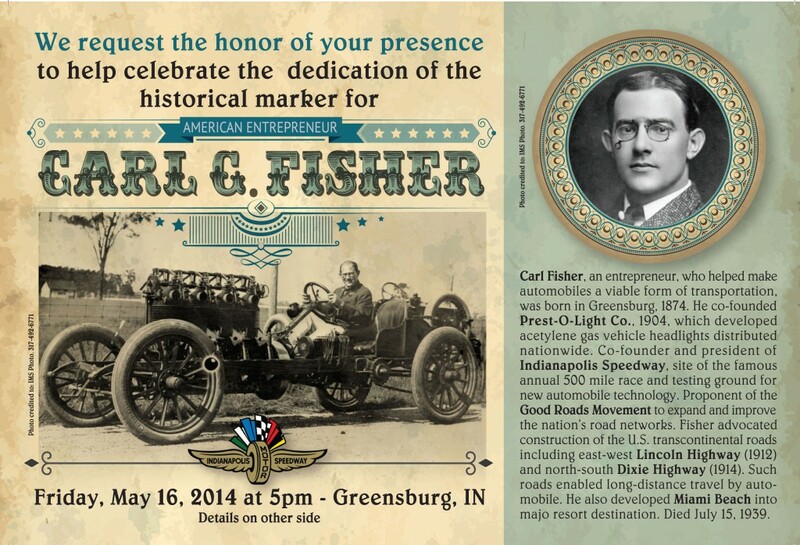 A public dedication ceremony for an Indiana state historical marker commemorating American entrepreneur, Carl Fisher, is scheduled for Friday, May 16, 2014. The marker will be dedicated at 5:00 P.M. (EDT) at the Washington Street entrance to the Decatur County Courthouse, located at 150 Courthouse Square, Greensburg, IN 47240. Parking is available around the Courthouse Square. Fisher, an entrepreneur who helped make automobiles a viable form of transportation, was born in Greensburg, 1874. He co-founded Prest-O-Lite Co., 1904, which developed acetylene gas vehicle headlights distributed nationwide. Co-founder and president of Indianapolis Speedway, site of famous annual 500 mile race and testing ground for new automobile technology. Proponent of the Good Roads Movement to expand and improve the nation’s road networks. Fisher advocated construction of U.S. transcontinental roads including east-west Lincoln Highway (1912) and north-south Dixie Highway (1914). Such roads enabled long-distance travel by automobile. He also developed Miami Beach into major resort destination. Died July 15, 1939. 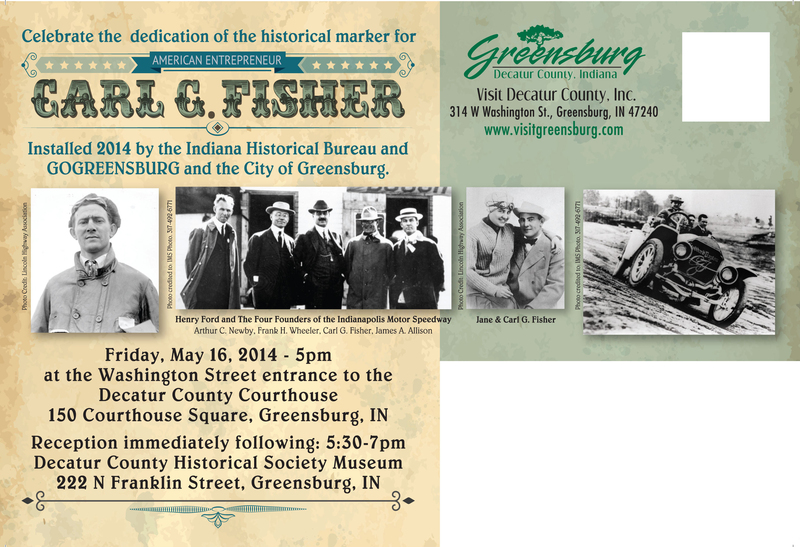 The public is invited to attend the dedication ceremony for this Indiana state historical marker that honors Fisher’s legacy as a pioneer of the automobile industry and a promoter of automobile culture in Indiana and the nation. A reception will follow the ceremony from 5:30-7:00 pm at the Decatur County Historical Society Museum at 222 N. Franklin St., Greensburg, IN 47240. State historical markers commemorate significant individuals, organizations, places, and events in Indiana history. These markers help communities throughout the state promote, preserve, and present their history for the education and enjoyment of residents and tourists of all ages. For more than 95 years the Indiana Historical Bureau, an agency of the State of Indiana, has been marking Indiana history. 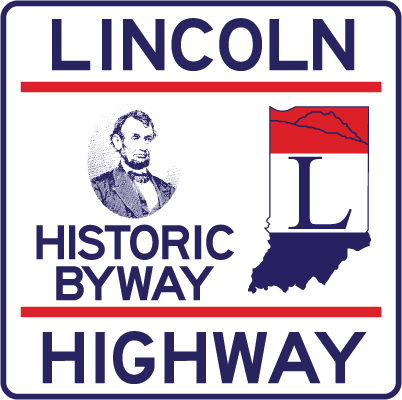 Since 1946, the marker format has been the large roadside marker, which has the familiar dark blue background with gold lettering and the outline of the state of Indiana at the top. There are approximately 500 of these markers across the state. For more information about this marker, the Indiana Historical Marker Program, and other resources about Indiana, visit the Indiana Historical Bureau’s website at www.IN.gov/history or call 317-233-8940.